(Natural News) Big Pharma is at it again: Taking a naturally occurring, freely available and inexpensive commodity, and creating a “chemical,” patentable version that they can market and make millions of dollars off of. The U.K.’s Express is reporting that researchers funded by the British Heart Foundation are working hard to develop a pill made from broccoli extract and ensure that it is freely available to the public within the next five years. It is hoped that this pill will help reduce the number of people affected by strokes each year. And make no error, that number is staggering. Figures from the Centers for Disease Control and Prevention (CDC) indicate that strokes kill more than 130,000 Americans each year. Somebody somewhere in the U.S. will have a stroke every 40 seconds, and one of those will die every four minutes. In addition to the human cost, strokes are also costly in terms of dollars and cents, costing the nation around $33 billion each year in healthcare provision, medication and lost work days. While it is, therefore, tempting to get excited about this potential new treatment, the fact is, the same benefits can be derived from just eating more broccoli, so why not get all the doctors to advise their patients to increase their broccoli intake to at least three to five weekly portions – the recommended amount to reduce stroke risk? The answer to that is obvious: There is no financial benefit to the doctors or pharmaceutical companies in doing so. Experts believe that sulforaphane, if taken preventatively, can help reduce the brain damage that strokes cause by raising levels of these protective enzymes. The humble broccoli is not only good at warding off strokes, however. Multiple studies have confirmed that it has a myriad of other health benefits, too. It is important to note, though, that it is not just sulforaphane that is responsible for these many benefits, and that is why it is far, far better to be eating fresh, non-GMO, organic, lightly steamed broccoli, than to pop a supplement that only offers the benefits of sulforaphane. It is known, for example, that broccoli offers protective benefits to the heart, preventing not just stroke, but also heart attack. While this is partly due to the sulforaphane, broccoli also contains glucosinolates, which in turn produce anti-inflammatory isothiocyanates (ITCs). ITCs are vitally important to reducing stroke and heart attack risk, because they prevent chronic inflammation within blood vessels and cells. It is also a fact that high levels of inflammation within arteries is very dangerous. Again, broccoli contains just the right combination of ingredients which work as a group to fight such inflammation, namely vitamin E, vitamin C, zinc, manganese, lutein, carotenoids, zeaxanthin, beta-carotene, quercetin and kaempferol. 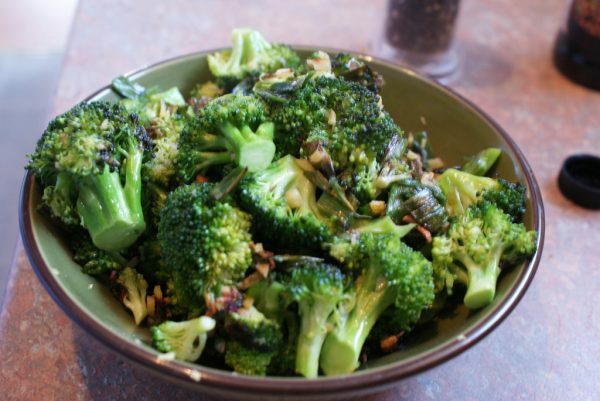 High levels of the phytonutrient indole-3-carbinol (I-3C) and fiber mean that broccoli also helps lower cholesterol – again, reducing heart attack and stroke risk. With so many reasons to eat more broccoli, don’t wait for Big Pharma to bring out a pill that just offers one of its benefits; start eating more delicious broccoli today!